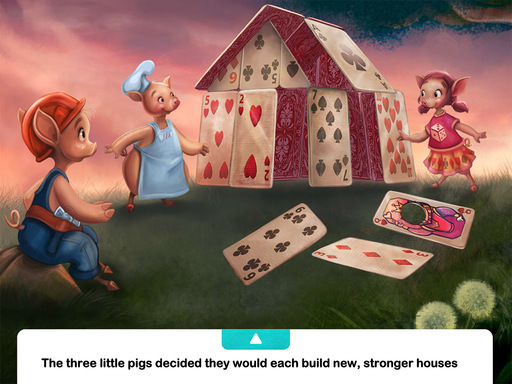 Tired of living in a leaky shack, three pigs build new houses: one of playing cards, one of cotton candy, and one of bricks. A wolf appears, and by huffing and puffing, blows down the first two houses but not the house of bricks. 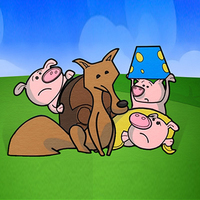 In the end, the pigs discover that the wolf is exactly like them: he just wants a safe place to live! Tired of their creaky, leaky, moldy old shack, three pigs innovate to build new houses out of playing cards, cotton candy, and bricks. When a big bad wolf shows up, he huffs and puffs and blows down the first two houses. When the wolf arrives at the third house, he finds it too strong to blow down. Then the pigs discover some surprising information about the wolf that makes them rethink their opinion of the wolf! 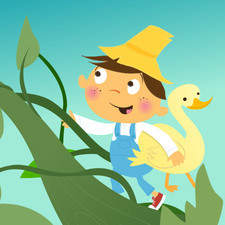 Kids can help the pigs build their new houses while parents enjoy the builder pig, Peter, voiced by Bob Villa. 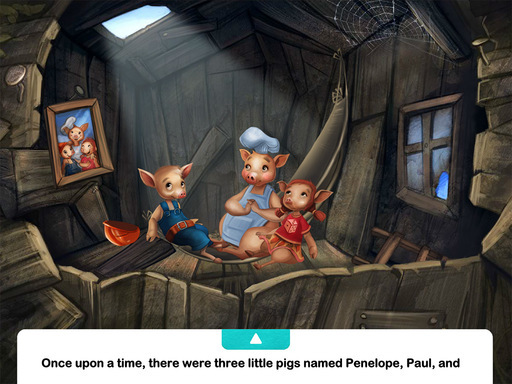 Once upon a time, there were three little pigs named Penelope, Paul, and Peter. The pigs lived together in a creaky, leaky, eensy, weensy, moldy, old shack. One night, while the pigs were sleeping, the old ceiling started to crack and—boom! Peter’s hammock fell on Paul’s hammock and Paul’s hammock fell on Penelope’s hammock, and all the little pigs fell down on the floor! “That’s it,” said Peter. “This old shack is falling apart! 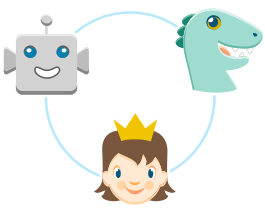 It’s time that we each get our own houses—strong houses that won’t fall apart!” The three little pigs decided they would each build new, stronger houses of their own. The first little pig loved to play games, so she decided to build her house out of playing cards. 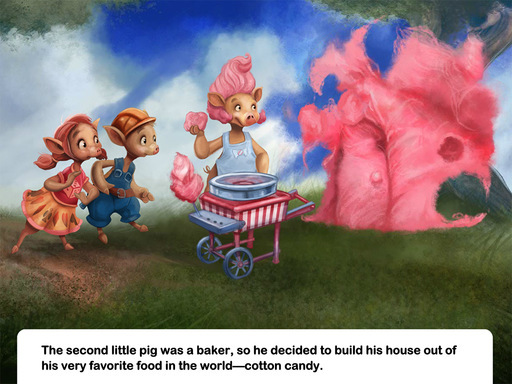 The second little pig was a baker, so he decided to build his house out of his very favorite food in the world—cotton candy. 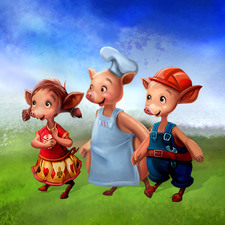 The third little pig was a construction worker. He knew all about building strong houses, and he decided to build his house out of bricks. 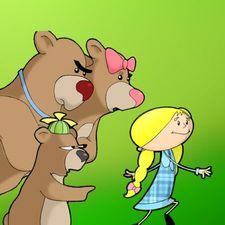 That night, the big, bad wolf came creeping up to Penelope Pig’s house and knocked on her door. “Little pig, little pig, let me in,” said the wolf. Penelope thought surely the wolf had come to gobble her up! “Not by the hair on my chinny chin chin!” she cried. “Then I’ll huff and I’ll puff and I’ll blow your house in,” said the wolf. The house of cards wasn’t strong enough. The big, bad wolf huffed and puffed and blew the house down. Whoosh! 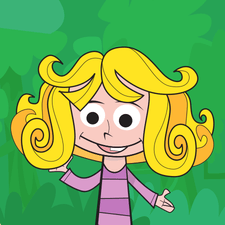 Penelope ran and ran until she came to her brother’s cotton candy house. “The wolf wants to gobble me up!” said Penelope. “Don’t worry, he won’t be able to get us in here,” said Paul. 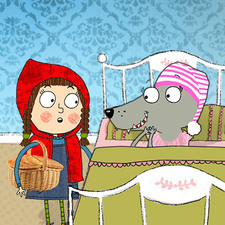 Outside, the big, bad wolf came creeping up to Paul Pig’s house and knocked on the door! “Little pigs, little pigs, let me in,” said the wolf. “Not by the hair on our chinny chin chins!” cried the pigs. “Then I’ll huff and I’ll puff and I’ll blow your house in,” said the wolf. The house of cotton candy wasn’t strong enough. The big bad wolf huffed and puffed and blew the house down! Whoosh! Penelope and Paul ran and ran until they came to their brother’s brick house. “The wolf is trying to gobble us up!” cried Paul. “Don’t worry, he won’t be able to get us in here,” said Peter. 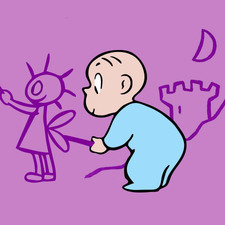 Outside, the big, bad wolf came creeping up to Peter Pig’s house and knocked on the door. “Little pigs, little pigs, let me in,” said the wolf. “Not by the hair on our chinny chin chins!” cried the pigs. “Then I’ll huff and I’ll puff and I’ll blow your house in,” said the wolf. But the house of bricks was too strong for the wolf. No matter how hard he tried, he couldn’t blow the house down. “Mr. Wolf, you’re not going to gobble us up today,” said Peter proudly. “Gobble you up?” asked the wolf. “I don’t want to eat you! 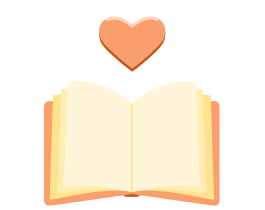 I just need a house where I can stay.” The wolf explained to the pigs that he loved candles. When it was time for him to build a house of his own, he had made it out of wax. But the house of wax wasn’t strong enough, and on a hot day the wax house melted away. 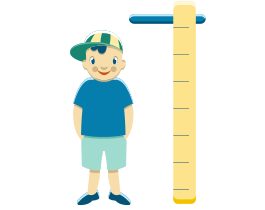 The next day, Peter gathered materials to build strong new houses. Penelope’s new house was going to be rectangular with hearts painted on it like a playing card. Paul’s new house was going to be pink and round just like cotton candy, and the wolf’s new house was going to be tall and thin like a candle. Now that they each had their very own, very strong houses, the three pigs and the big, not-so-bad wolf lived happily together in their homey, comfy, cozy, new neighborhood.